Everybody loves a good ghost story. There’s nothing quite like the spine-tingling, heart-thumping thrill you get from hearing about faint figures, tortured screams and the unexplained pitter-pattering of footsteps. If you fancy yourself a ghost hunter, you’ll be pleased to hear that Auckland is home to some seriously spooky spots. From the weird and the creepy to the downright unbelievable, we’ve rounded up eight Auckland spots that are rumoured to house both good and baaad juju. Let’s get spooky. One of New Zealand’s most haunted spots is closer to home than you think. Sitting creepily along Richmond Road (just down the road from the shops) is Carlile House. The former orphanage was built in 1886 and 43 young boys were tragically killed there during a fire in 1912. The souls of these children are said to still wander the corridors, with brave visitors reporting shrieks, ghostly figures and eerie rushes of wind. Yikes. Hand’s up who’s been to Camp Adair? If you grew up in Auckland, chances are you’ve stayed at or heard about this Hunua camp. But did you know about it’s creepy urban legend? Rumour has it that a group of children were murdered in the School House Building by their teacher. Apparently the red-headed teacher can be seen lurking through the windows. Spook-ay. Once a mental asylum and now a university campus…who thought that was a good idea? Students and staff have experienced a large number of weird happenings at Carrington. Building 76 was a male ward for the most violently dangerous patients and, building one had around eight deaths a year, with one woman being burned alive by another patient. Eeek. Unusual activity includes shadows, voices, flickering lights, things flying across rooms, ghostly figures, students and tutors being ‘pushed’, sensations of being slapped, screaming…the list goes on and on. Opened in 1865, The Queen’s Ferry Hotel on Vulcan Lane is thought to be one of New Zealand’s oldest pubs and with age comes…ghosts. There have been three natural deaths in the building, which could be responsible for the spooky happenings. Taps and lights are said to turn on by themselves and there’s a feeling like someone is watching you. Apparently a girl was smooching her boyfriend in The Gin Room and actually saw ‘people’ perving on their pash fest. Haunted Auckland did a wee investigation and gave it the a-ok, so you don’t have to worry about sharing your gin cocktail with a ghost. Once a psych hospital and now Spookers, Kingseat is supposedly one of the most haunted locations in the country. Apparently more nurses died than patients, with staff suicides being common on the grounds. It was a stressful job and the emotional drain took its toll. 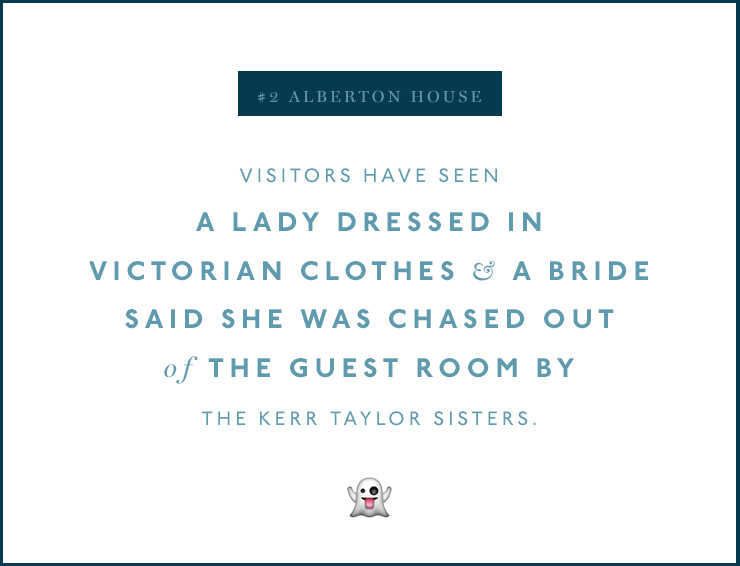 Visitors have noted ice cold chills when entering rooms, thick and heavy air, and apparitions of a “Grey Nurse” in and around the former nurses’ home. Built in 1929, this iconic theatre is bound to have some stuff going on. Haunted Auckland investigations reported both male and female presences with some of them giving mischievous answers when asked for their names. 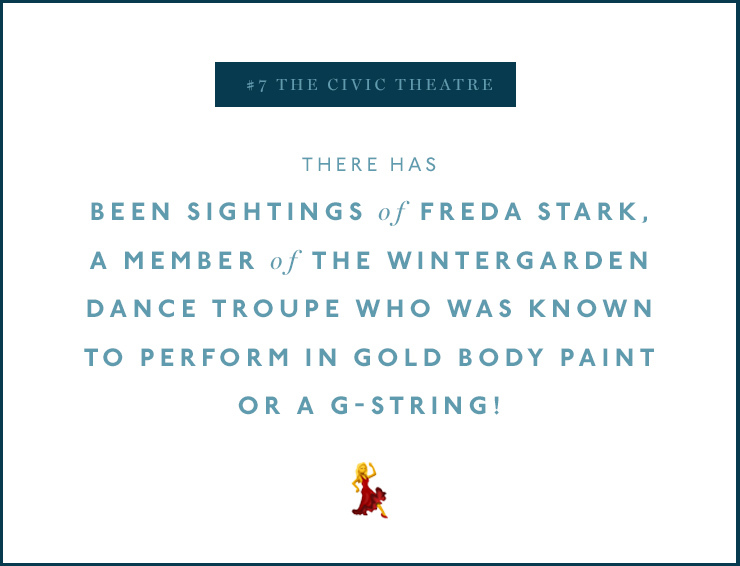 There’s also been sightings of Freda Stark, a member of the Wintergarden dance troupe who was known to perform in gold body paint or a g-string! Apparently ‘Ernie’, Playhouse Theatre’s resident ghost since World War 2, gets up to all sorts of mischief. He is often blamed for mishaps and has been witnessed in the lighting booth. Some have also claimed to been ‘pushed’ when walking down the stairs from the booth. NB: Don’t mess with Ernie’s booth.